Two University of Houston scientists are reporting that defects in a portion of the brain’s hippocampus, called the dentate gyrus, are regulated by the nuclear receptor LXRβ (Liver X receptor Beta). The dentate gyrus, or DG, is responsible for emotion and memory and is known to be involved in autism spectrum disorders (ASD). Jan-Åke Gustafsson, second from right, and Margaret Warner, far right, with their team that is advancing the understanding of autism. Margaret Warner, professor of biology and biochemistry, and Jan-Åke Gustafsson, professor of biology and biochemistry and founding director of the UH Center for Nuclear Receptors and Cell Signaling, describe the work in the Proceedings of the National Academy of Sciences. 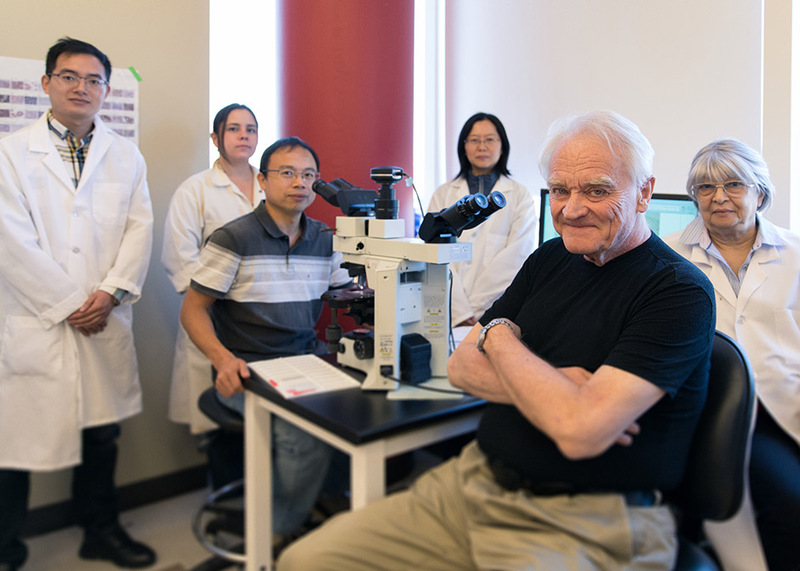 For four decades they have worked together, making discovery after discovery about the role of nuclear receptors in brain functions, and they show no sign of slowing down. Neurogenesis, or the regulation of growth of the dentate gyrus, occurs prenatally and postnatally. “Our findings suggest early changes in DG neurogenesis ultimately provide an aberrant template upon which to build the circuitry that is involved in normal social function,” Warner said. Their studies propose that defects in the neurogenesis of the DG seem to be involved in the etiology of autism spectrum disorders and their associated behaviors. Specifically, defects in the nuclear receptor LXRβ have emerged as the possible culprit of defects in the DG. In the world of physiology (how the organisms in our bodies communicate and keep us alive), nuclear receptors rule the day. They are a class of proteins within cells that control hormones and regulate metabolism. One of these proteins, LXRβ, may be the one that holds the key to the genesis of autism. Warner and Gustafsson established this the only way they could – by taking LXRβ out of the equation. Gustafsson said the findings are the path forward in autism research. “The Liver X receptor Beta is important in the dentate gyrus and in autism, and more studies on the receptor are going to help us cure or treat autism,” he said. He should know. He’s the scientist who discovered LXRβ in 1996. “Until 1996, we did not know that this receptor even existed, and it is so important in brain function,” Warner said. On the project, the UH team includes Wanfu Wu, a research assistant professor. They are joined by Yulong Cai, Xiaotong Tang, Xin Li, Ying Wang, Xiaohang Bao, Lian Wang, Dayu Sun, Jinghui Zhao, Yan Xing, Xiaotang Fan and Haiwei Xu from Third Military Medical University in Chongqing, China.